"2018 marked an important turning point for SBM Offshore on several fronts. We closed out our legacy issues and with growth returning to the market, we are now seeing the results of our efforts to transform our offering and ways of working. Our Fast4WardTM concept is being recognized by our clients. The planned order of a third Fast4WardTM hull reflects our confidence in the market recovery and our business model. With the outlook for demand increasing, the level of opportunity and potential that we see for our solutions looks promising. We are stepping up our efforts to leverage our experience to enhance the sustainability of our current products for the oil market, with an ambitious target to lower the level of CO2 emissions per barrel produced. As the energy transition gains further momentum, we are committed to develop products and services for the gas and renewables markets. We are significantly increasing shareholder returns, underpinned by the continued track record of delivery from both business segments, Turnkey and Lease and Operate, as evidenced by the results published today. The combination of the proposed c. 50% increase in the dividend and the EUR175 million share repurchase is currently equivalent to an 8% return or c. US$1.34 per share for shareholders." Directional revenue increased 2% year-on-year to US$1,703 million, benefiting from an increase in Turnkey activity, which more than offset a decrease in Lease and Operate caused by FPSO Turritella leaving the fleet and planned maintenance. Reported 2018 Directional EBITDA totaled c. US$1 billion. Underlying 2018 Directional EBITDA at US$784 million was nearly constant year-on-year and in line with Company's guidance. Items restated in Underlying EBITDA can be found in the table above. Lease and Operate EBITDA decreased by 14% mostly due to FPSO Turritella leaving the fleet. 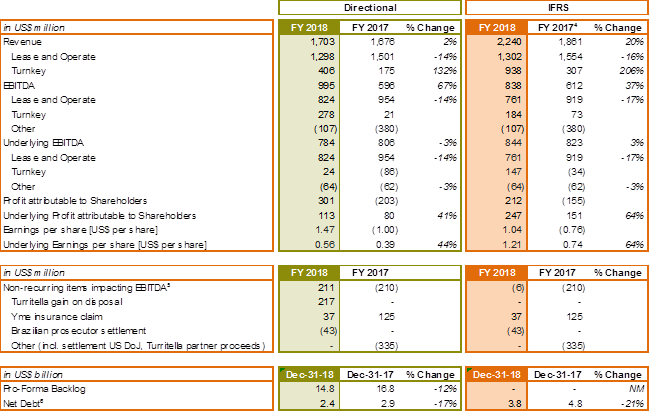 Turnkey 2018 Underlying EBITDA increased to above break even on the back of increased activity levels, realized savings in overhead and IFRS16 implementation (c. US$30 million). These Turnkey results and the overall guidance were achieved despite the decision not to pursue a partnership on Liza Destiny and so retain full ownership. This has deferred to the operating phase the revenue and margin which would otherwise have been realized in 2018 from the previously planned 50% divestment. By retaining full ownership, SBM Offshore will generate a significantly higher aggregate cash flow and profit over time. Underlying 2018 Directional profit attributable to shareholders increased by 41% year-on-year to a total of US$113 million. At year-end 2018 the Company had undrawn credit facilities of US$1,720 million comprising the Company's US$1 billion Revolving Credit Facility and the Liza Destiny loan7 for US$720 million. Directional net debt decreased by US$0.5 billion at year-end 2018, to a total of US$2.4 billion. Both net debt as at year-end 2017 as well as year-end 2018 include the effect of IFRS16 (c. US$0.2 billion). The reduction was achieved despite significant investment for growth (mainly in FPSO Liza Destiny and the two Fast4WardTM hulls) and was largely due to the strong operating cash flow from the Lease and Operate segment. The net proceeds from the Yme insurance claim and the FPSO Turritella disposal offset to a large extent the payment of the non-recurring penalties as a result of the Leniency Agreement. Excluding the lease liability recognized under IFRS16, all the Company's debt consists of non-recourse project financing in special purpose investees. SBM Offshore provides an overview of pro-forma Directional backlog8. The pro-forma Directional backlog as of December 31, 2018 decreased by c. US$2 billion to a total of US$14.8 billion. This decrease was caused in part by US$1.7 billion of turnover during the year but also takes into account the expected early purchase of FPSO Liza Destiny after a period of two years of operations, instead of the contractual ten year lease, which leads to a further decrease in the backlog of c. US$0.7 billion. This overall decrease in backlog was partly offset by US$0.4 billion of order intake in Turnkey during the year. SBM Offshore's first standard, multi-purpose hull is progressing well and according to schedule. In November 2018, the Company announced the second hull for which progress is in line with expectations. Due to anticipated demand, the Company has progressed negotiations to start work on its third standard, multi-purpose hull. These negotiations are expected to be closed in the first quarter of 2019. The major project FPSO Liza Destiny is making good progress according to schedule. The last modules were lifted on board and commissioning activities are currently taking place. Sail-away is planned for summer 2019 so that the vessel can be installed offshore Guyana later in the year. In Guyana, work is underway with respect to operations readiness, setting up the shore base and delivering on our local content commitments. With engineering now nearly completed, the fabrication of the complex turret mooring system for the FPSO Johan Castberg is well advanced in Dubai and remains on track to meet client schedule with delivery early in 2020. The total historical Lease and Operate fleet uptime performance remains 99%. In 2018, a fleet uptime of 98% was achieved, integrating the planned maintenance and life-time extension campaign on FPSO Capixaba. FSO N'Kossa received a short term lease extension before it was sold at the end of 2018. In early 2018, the Turnkey related organization was restructured bringing the staffing of projects and functional support across the globe under centralized management. This has facilitated further efficiency and productivity by allowing more effective leverage of the Company's overall experience and resource base. Given the positive market outlook backed by ongoing project and engineering study work, the Company is implementing a new resourcing model to ensure it will be able to appropriately service increased anticipated demand. The model is managed through a stage gate process linked to contracts from clients. While it involves the recruitment of new SBM Offshore engineering staff, the model utilizes a much higher degree of subcontracting of partner companies and individuals compared to the past. This will afford a greater degree of flexibility to ramp up or down depending on market conditions. As part of this model to support growth, the Company is establishing a High Value Engineering Centre in Bangalore, India, with its long-term existing partner Nauvata. The primary purpose of the partnership will be to provide quality detailed design services for SBM Offshore projects. As India has become a global source for innovation and economics, establishing presence there is a logical strategic move. The Engineering Centre will start with a light structure which will however allow for rapid growth to meet the expected workload increase to come. SBM Offshore's safety performance continued to be strong during 2018. The Total Recordable Injury Frequency Rate (TRIFR) of 0.18 showed a similar performance compared with the Company's best ever TRIFR performance of 0.19 achieved in 2017. The fact that safety can never be taken for granted was underscored by a tragic event in October 2018 in which one of our contractors was fatally injured in an incident at a construction yard. In 2018, steps were taken to further strengthen the culture and practice of Process Safety Management with the launch of the Process Safety Fundamentals: these aim to increase awareness among all employees to perform their work in a way that is as safe as possible. Over the past few years the Company introduced initiatives to reduce its global CO2 footprint, including the CO2 Challenge. These initiatives have assisted the Company in reducing the fleet's greenhouse gas emissions per unit of production by almost 40% over the past three years. Building on this and other initiatives, SBM Offshore is further embedding sustainability into its business by developing for 2019 quantified targets for three Sustainable Development Goals (out of the seven selected for implementation of its sustainability strategy). SBM Offshore's overall performance on environmental and social criteria was recognized once again: for 2018, the Company was included in the Dow Jones Sustainability Europe Index in the category OIE Energy Equipment & Services and improved its CDP (formerly Carbon Disclosure Project) score to B. Moreover, SBM Offshore is committed to respecting internationally-recognized human rights, and became a member of Building Responsibly, a group of leading engineering and construction companies working together to raise the bar in promoting the rights and welfare of workers across the industry. Following the Fifth Chamber approval of the Agreement with the Brazilian Federal Prosecutor's Office (Ministério Público Federal - "MPF") as disclosed on December 18, 2018, the MPF has made a court filing to terminate the improbity lawsuit including the associated provisional measure to secure payment of potential damages. The MPF initiated the improbity lawsuit in 2017. Upon closure of the lawsuit, the Agreement with the MPF will become fully effective, after which SBM Offshore will pay the earlier announced fine of BRL200 million. In accordance with the terms of the Leniency Agreement signed between SBM Offshore, CGU, AGU and Petrobras on July 26, 2018, effective from that date, the Company received confirmation that the Administrative Proceeding before the CGU against SBM Offshore was terminated. The Company is close to finalizing an agreement with Repsol with respect to the sharing of proceeds and costs related to the Yme insurance case handled by the Company. SBM Offshore has provisioned for a total cost of c. US$185 million, covering payment to Repsol and other insurance related expenses, payable after signing of an agreement. Total recovery by the Company is expected to end at c. US$200 million overall, which includes compensation for legal expenses paid by the Company during the years of the complex litigation. SBM Offshore signed a new five year sustainable Revolving Credit Facility (RCF) agreement on February 13, 2019. The US$1 billion amount of the facility and its competitive pricing are aligned with the previous facility. The key change is that the potentially growth-restrictive leverage covenant of the former RCF has been replaced by a Lease Backlog Cover Ratio (LBCR). The LBCR links availability of the RCF to the future contracted cash flows of a defined portfolio of operational FPSOs in the Company's backlog. As at signing, the LBCR would allow for corporate borrowing significantly in excess of US$1.5 billion. The facility includes an uncommitted option to increase borrowing by US$0.5 billion and pricing can increase or decrease by 0.05% based on the absolute change in the Company's performance with respect to sustainability as measured by an independent specialist. In line with the Company's dividend policy and further taking into account the specific circumstances relating to 2018 including the nature of the non-recurring items, the Company proposes a dividend of US$75 million, or c. US$0.37 per share in respect of 2018, to the AGM on April 10, 2019. This dividend per share calculation is based on number of shares as at December 31, 2018 before taking account of the 2019 share repurchase program, as announced today in a separate press release. The proposed dividend represents a c. 50% increase per share compared to last year and represents a pay-out of circa 25% of the Directional 2018 net result. The proposed ex-dividend date is April 12, 2019. The dividend is payable within 30 days following the AGM and will be calculated in US dollars but payable in euros. The conversion into euros will be effected on the basis of the exchange rate on April 10, 2019. Given the Company's cash position, the dividend will be fully paid in cash. The Company reviews its dividend policy on a regular basis. The Company plans to simplify the policy by focusing purely on cash flow and removing the additional reference to Directional net income in the policy. This results in the new policy as follows: "The Company's policy is to maintain a stable dividend, which grows over time. Determination of the dividend is based on the Company's assessment of its underlying cash flow position". The proposed change to the dividend policy will be presented for discussion at the AGM on April 10, 2019. Having reviewed the current liquidity position and the resulting cash flow outlook, the Company has determined that it currently has the capacity to fund growth and repurchase shares for an amount of EUR175 million (c. US$200 million). For further details, reference is made to the separate press release on the matter on February 14, 2019. Management confirms its continued positive outlook for the Company. The recovery may not be industry-wide, however the recovery is visible within the area of large-size FPSOs with expected multiple awards for the coming years. SBM Offshore, as an industry leader with its game changing Fast4WardTM program, is well positioned to be one of the key players to benefit from the upturn in the market. The Company's 2019 Directional revenue guidance is around US$2.0 billion, of which US$1.3 billion is expected from the cash generating Lease and Operate segment and around US$700 million from the Turnkey segment. Directional EBITDA guidance is around US$750 million for the Group. SBM Offshore has scheduled a conference call and webcast of its presentation to the financial community followed by a Q&A session at 10.00 Central European Time on Thursday, February 14, 2019. 1 Directional view, presented under IFRS8 Segment reporting, represents a pro-forma accounting policy, which assumes all lease contracts are classified as operating leases and all vessel investees are proportionally consolidated. This explanatory note relates to all Directional in this document. 2 Underlying 2018 EBITDA excludes one off effects in 2018 and 2017 to enable comparison of like-for-like underlying performance. For explanation of the various items that were adjusted, see the table in section "Overview". 3 Dividend per share takes into account the proposed dividend (US$75 million) and the number of shares as of December 31, 2018 (204.7 million) - whereas the final dividend per share will be dependent on progress of the announced share repurchase program. 4 2017 IFRS results were restated to separately present 'net impairment losses on financial and contract assets' in the Income Statement following the adoption of IFRS9; with no material impact. 5 An overview of non-recurring items which have an impact on financial performance underneath the EBITDA level can be found in the FY 2018 Financial Statements and webcast presentation. 6 Net debt has been presented to include the impact of IFRS16 under Directional and IFRS as at year-end 2017 and 2018. 7 Loan availability subject to fulfilling of certain conditions precedent, including various documentation requirements. 8 The pro-forma backlog includes the FPSO Liza Destiny operating and maintenance scope, which is pending a final work order. It also assumes that FPSO Liza Destiny will be purchased by the client after a period of two years of operation, which is under discussion as previously announced. This purchase is reflected in the Turnkey backlog whereas the first two years of operation are included in the Lease and Operate backlog.